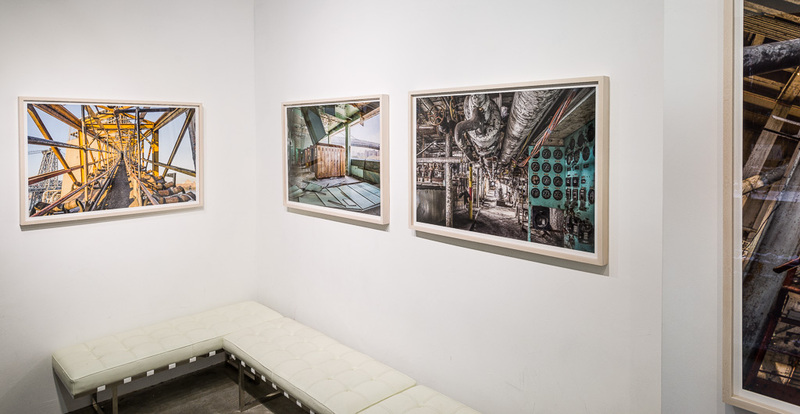 Over the last four years, with the Domino Sugar Refinery series, I’ve been making 40 and 60 inch-wide prints. A few collectors who are new to larger prints have asked me for framing and display advice. Here’s some of what I’ve learned. Big prints need to be mounted on something rigid. This step merits the most attention—because it’s permanent; because the print could be damaged during mounting; because the print will be in contact with the mounting materials, and any chemicals present, basically forever. I believe the best all-around mounting material for prints larger than 30 inches is Dibond. This is an aluminum laminate that is rigid, perfectly flat, reasonably lightweight, and made from acid-free, archivally stable materials. 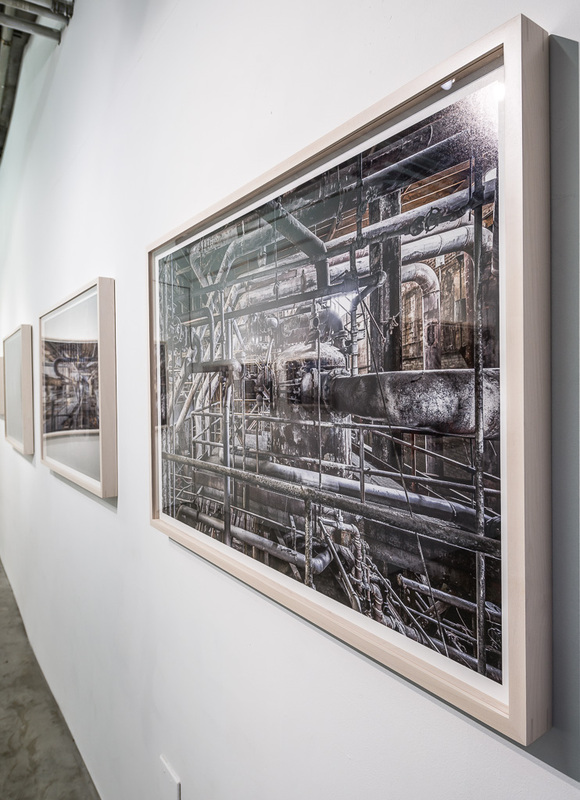 Photographs are cold-mounted to Dibond using using a pressure-activated dry adhesive. Technicians use a mounting table with an assembly of rollers that the print/Dibond assembly passes through. Because a mistake can cause irreversible damage, you should only have the work mounted by experts. If you don’t know anyone in your area, I can consult with my gallery directors to see if they have connections near you. You can can also call the conservation department or photography collection manager at a local museum. Find out who they use. If you’re in the NYC area, a good option is to let my printmaking studio mount the work for you. If they make a mistake, they’ll simply reprint and start over, and you’ll never have to suffer hearing about it. If you’re farther afield, then you’ll probably want to have the mounting done locally. A large mounted print needs to be packed in a custom crate and shipped by freight. It’s unlikely that this will be the best value. If the people doing your mounting make a mistake and damage the print, contact me. I can replace the print for the cost of materials and shipping, so you won’t be faced with a total disaster. Such a mishap is always a possibility, but happily, it hasn’t happened yet. Framing is more casual than mounting, because it’s reversible. Nevertheless, the expense of framing big prints means it’s never entirely casual. 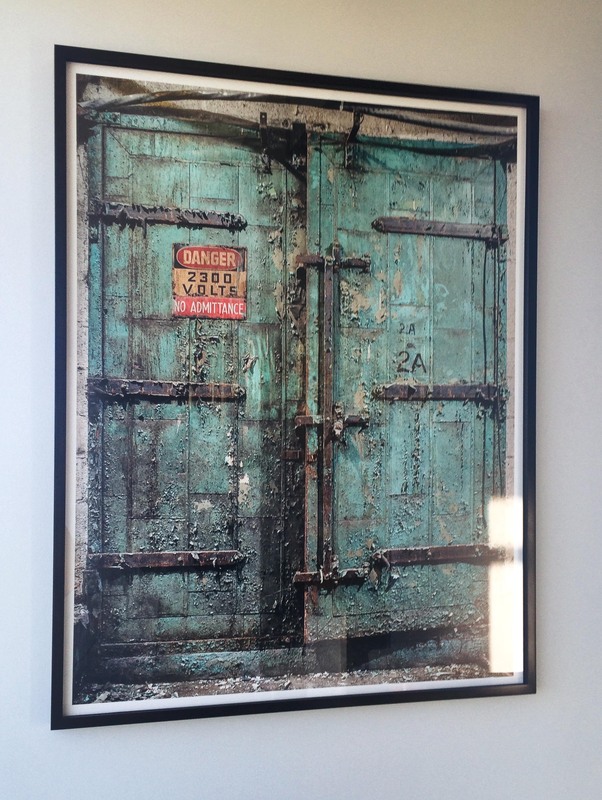 There are only a couple of ironclad rules: use plexiglass for large prints, not glass. Use a framing method that keeps the print from touching the glazing. I used the “101” profile for the 60” and 40” prints. It’s strong, and substantial looking enough for a big print, but doesn’t distract from the work. Most frame shops should have something similar. I use maple, and and have been getting it finished with a translucent white lacquer that lets the wood grain show through. I’ve also seen examples that look great in a natural maple finish, in a darker wood (like red oak or cherry), and in black. 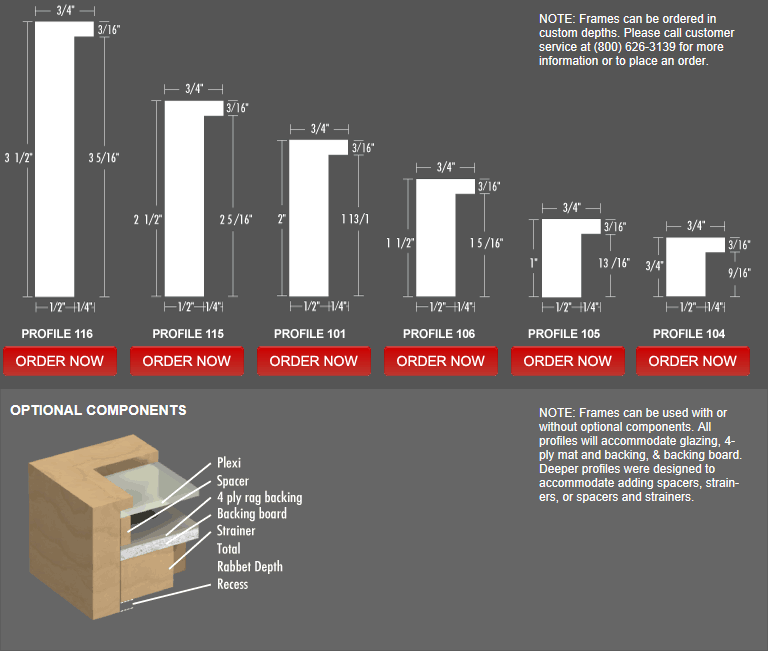 The “optional components” illustration shows how the frames and artwork go together. This stuff is actually mandatory if you’re framing without a window mat. First there’s the plexi*, then a 3/8” or 1/2″ spacer (typically matches the finish of the wood frame), then the mounted art, then a wood “strainer,” which is a subframe that holds the whole thing together and screws into the outer frame. This will all be old news to your frame shop. This is a little more expensive than using v-nails or other methods, but is stronger, and I think quite beautiful (if you’re getting a clear or translucent finish). It’s also a decent litmus test for a frame shop; if you ask about this and they have no idea what you’re talking about, they may not be the best shop for fine art framing. Translucent white lacquer over maple. 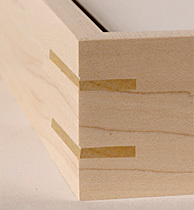 Closeup showing spline joints and deep profile of the moulding. A collector in Sweden used what looks like red oak. I think it works well also. 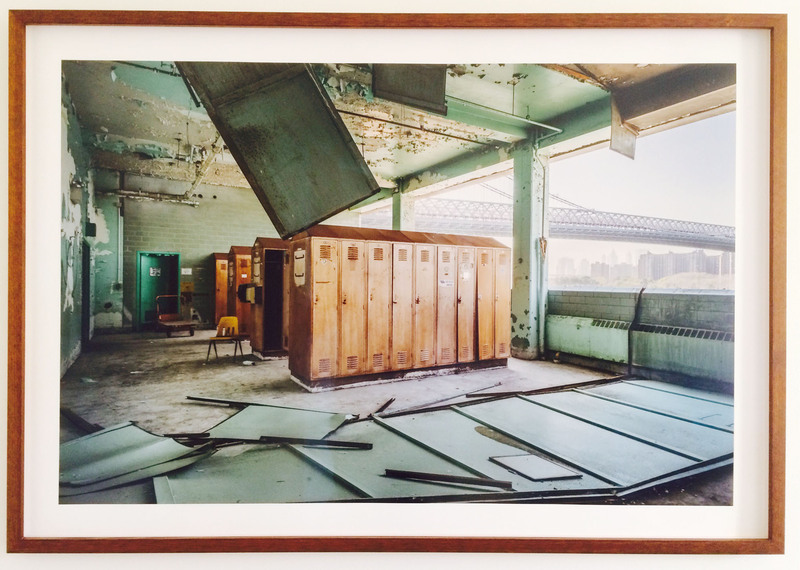 A Brooklyn collector chose black lacquer for this 60″ print. The translucent white frames above, as well as the framing diagrams, come from Metroframe in Minnesota. They make frames of the highest quality for museums across the U.S. and Canada. Their prices are also around 1/3 those of the best frame shops in New York City. The catch is that you have to install the work in the frames yourself—which is not trivial, especially if you’re talking about 60” prints. You have to know what you’re doing, and even then, if you don’t have an adequately large and dust-free workspace, you will suffer. So please consider this approach only if you’re prepared to take on the work. The excellent instructional videos on Metroframe’s website will give a sense of what you’re in for. Also keep in mind that you’ll still need someone local do the mounting—which means transporting a large, mounted print to your workspace. In most cases it will be easier to have the framing and mounting handled by the same people. Avoid foam products (dubious durability and archival properties). Definitely avoid Sintra (a lightweight, rigid board made from PVC—an unstable plastic that poses serious problems for archival conservation). With prints below 20″ or so, you may be able to avoid mounting entirely. Work can be attached to an archival backing board (usually 4-ply museum board) either with paper corners, with a hinge of linen tape, or a hinge of paper and rice paste. These are the most conservation-friendly approaches, because they’re completely reversible. Damage to the matboard does not equal damage to the artwork. The tradeoff is that this type of attachment does not hold the print perfectly flat, the way mounting does. With some papers at some sizes you may find the waviness of the print objectionable. You may also find that the relative flatness of the print changes with the humidity. For a more traditional presentation style, it’s hard to beat window mats. These are cut by hand or laser cutter from 4-ply board (occasionally 8-ply for larger works). They keep the print away from the glazing and the moulding, protect the edges, and give the work a wide visual separation from its frame and surroundings. Considerations for framing small prints are much like those for large prints, although you don’t have to be so concerned about strength. You don’t need splined frame joints (although they look great), and you don’t absolutely need a strainer to hold the whole package together; you can get away with nails or framing points. What about Face-Mounting to Plexiglass? Longer answer: This was fashionable in the photography art world in the 1990s and 2000s, due to its fiercely minimalist and modern good looks. The problem with face-mounting is that the glazing is no longer protection for the artwork—it is the artwork. If you scratch the glazing, which is trivially easy to do, you’ve damaged the print. And the face-mounting process is absolutely permanent. It’s also expensive, with a high failure rate—a dubious cocktail of high risk and conspicuous consumption. If you’re not deterred, be sure to make friends with professional art movers, and with an insurance company that caters to the well-heeled. It will come wrapped in lint-free, acid-free tissue, rolled in a shipping tube. Please resist the urge to unpack it. Fine art photo paper is extremely fragile, especially in the large sizes. Almost anything can scratch the surface or leave a permanent crease or ding. A 60 inch print needs to be handled with paranoid care, by two white-gloved people who know what they’re doing, in a large and clean workspace. Your frame shop should qualify. If you want to peek, let them unfurl the print for you. I don’t like to handle my own large prints before they’re mounted—it’s too stressful. *Unless you’re planning to hang the print somewhere that gets direct sun—not recommended—you should be fine with standard plexi, rather than the much more expensive uv-blocking plexi. Standard plexi actually blocks most of the ultraviolet spectrum, and is adequate for most installations. If you illuminate the work with halogen bulbs, and are worried about the UV they emit, you can get add-on UV-blocking filters for the bulbs, or just get bulbs with built-in filtration. These solutions are much less expensive than covering the whole print in UV plexi. There’s an even higher-end option, called Museum Acrylic, which not only absorbs the full uv spectrum, but has multiple optical coatings to block glare and reflections. The result is glazing that’s practically invisible. It’s also expensive on a whole other level; be prepared to spend as much or more on the glazing as on the mounting and framing combined. Needless to say, this material, while awesome, is not a popular choice. **I prefer a buffered board, like Talas Alpharag, Archival Methods Museum Board, or Light Impressions Exeter Conservation board, for mounting and overmatting. In my experience it’s less likely to attract paper mites, and it offers some minor protection against acids in the environment. Unbuffered museum board is required for dye sublimation prints and cyanotypes.